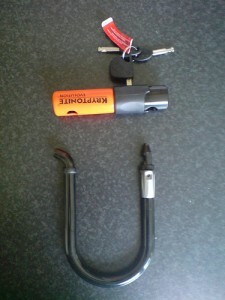 The Kryptonite Evolution Mini D (or U) lock is a favourite amongst bike messengers and hipsters. It’s popularity is no doubt due to it’s combined size (3.25” x 5.5”) and strength. The small size is perfect for filling the D of the lock with bike (see our guide – How to lock your bike) – any space left leaves an opportunity for a thief to get tools in and pop it open. The size also helps for portability – many people just stick their Evolution Mini in their back pocket. This lock is perfect for leaving your bike for a few minutes. You may find however that using this lock as your only lock (not recommended – always use two locks!) limits where you can park your bike – you can only just fit a tube of your bike frame and a regular bike post through it. Kryptonite Bike Lock with 4-Feet Kryptoflex Cable ££ More details! On-Guard 8005 Pitbull Keyed Shackle Lock ££ More details! Blusmart Bike Security Cable Lock Combination with Flexible Mount Twisted Metal Cable £ More details! Oxford OF178 GP Chain Lock £ More details! H&S® 6/8/10mm Dia x 1.2/2M HEAVY DUTY Motorcycle Motorbike Bike Bicycle Cycle Chain Lock PadLock £ More details! The Evo Mini is small yet strong, with a 13mm steel shackle, hence the 0.9Kg weight. It is rated Silver Sold Secure and rated 9 out of 12 on Kryptonite’s own scale of strength. Kryptonite locks suffered from a flaw previously where the old style cylinder locks could be opened with a pen. The whole locking system has been reworked to use a flat key which eliminates that vulnerability. What is worth noting is the curve in the end of the lock. This allows only one locking pin to be used which is cheaper for production but also means a thief only needs cut the lock in one place to get in. The Kryptonite New York series of locks use two locking pins, which is part of the reason for their higher security rating, and price. Kryptonite locks come with a guarantee which is in reality, a useless marketing ploy. In summary, this is a great lock and worthy of the price. I use this as a secondary lock to secure the front of my bike alongside my main lock, a Kryptonite New York 3000 which is bigger and even more secure. The first and the most important feature you must know about this model is the type of material, the manufacturer used in the production process. It is MAX performance steel, a unique sub-type of steel known for impressive strength. This means that the lock is resistant to bolt cutters! Still, this lock isn’t recommended for leaving a bike for a longer period of time. There are 3 keys packed with the Kryptonite Evolution Mini, which isn’t anything special. However, one of them has arechargeable battery and a light. This makes finding a key and the lock much simpler and quicker. The battery can be recharged in a matter of minutes, simply because it is based on the latest generation. Other two keys are ordinary and they will be aperfect replacement if you lose the first one. The feature in question is something that makes this lock a bit special. In general, the unique design allows you to mount it on frames with a diameter between 25 and 80 mm. The best part is the fact it can be mounted on frames with thetubular, square and oval shape. Simply said, no matter what type of a bike you have, the lock in question will be 100% useful. Rotating your new lock and placing it as you want or as the circumstances recommend, is more than just possible. This lock features 360 rotating features which have two, minor advantages. It allows you to use it anywhere and in any condition. There is no point in saying that using the feature in question is simple and it isn’t time-consuming. So, what we think about the Kryptonite Evolution Mini? As the name suggests this is a smaller lock perfect for minor applications. An interesting fact, despite it, has been developed for securing your bike when you are leaving it for a few hours, this lock is more than just resistant to all known threats. The main advantage is the material. The MAX performance steel is extremely hard and it will make this lock completely immune to all types of cutters. Adding a key with a rechargeable battery and a light is definitely an interesting and useful addition. We liked this feature a lot and we like it even more simply because it is for the first time seen in mini locks. At the end, this is a safe lock, designed for most applications you may have in mind. Have any questions or comments about this lock? Let me know in the comments.